The 1922 Stone Separate Tension Orchestra Drum by Boston's George B. Stone & Son is cleaning up nicely. The decades of dirt and grime have been removed and the shell and hardware are polishing up nicely. Liberon Black Bison Paste Wax did a beautiful job on the shell and I would highly recommend this product for breathing life back into aged natural finishes on antique drum shells. This was the second clean up project on which I've used the Liberon and I've been happy with the results both times. The maple color wax was a perfect match for the orange shellac finish. The hardware was all cleaned using one of two processes. 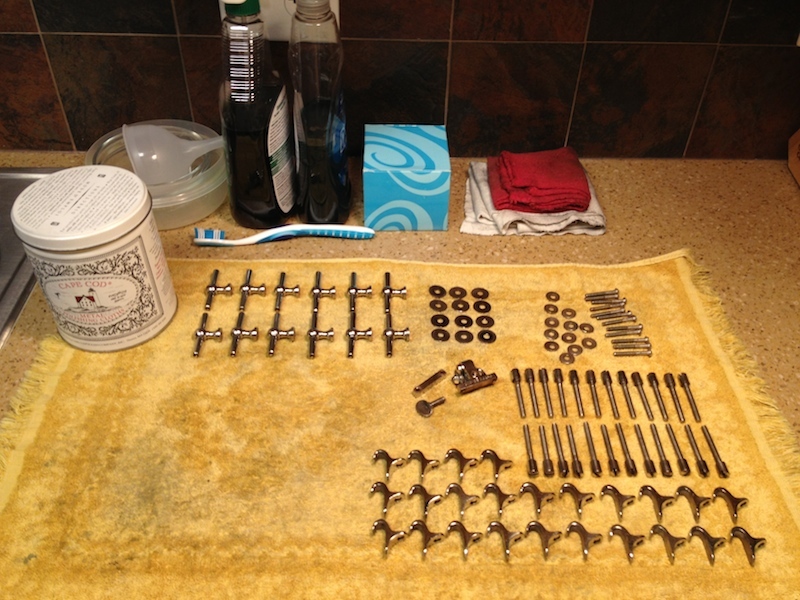 Some of the pieces (tension rods, rim clips, and strainer) were soaked in Dawn dish washing soap and then scrubbed with a toothbrush to remove any remaining grime before being thoroughly rinsed in very hot water and quickly dried. I tried a different process on the rest of the hardware (mounting screws and lugs) which was to simply soak the parts in Simple Green All-Purpose Cleaner and then rinse and dry them. This was the first time I've tried using Simple Green but I have to say it did at least as good of a job as the Dawn and without nearly as much elbow grease! After cleaning, the parts were polished with Cape Cod Polishing Cloths which did a terrific job of gently bringing back a brilliant shine to the antique nickel plating. I've used these before and will use them again. They will not scratch delicate plating and have no unpleasant odor which you can get from a lot of metal polishes. Pictured below is all the hardware ready for reassembly. Coming soon: the completed project!